In September, the Zimbabwe Parks and Wildlife Management Authority (Zimparks) revealed that the country would soon receive a donation of gorillas from the DRC. Mountain gorillas photographed in their native habitat in the mountains of Rwanda, some 1,900 kilometers north of Zimbabwe’s Manicaland province. Image by Ludovic Hirlimann via Flickr CC BY 2.0. The head of Zimbabwe’s wildlife authority says the agency plans to receive a donation of gorillas and okapis from the Democratic Republic of Congo (DRC), part of a wildlife exchange program that recently saw 10 white rhinos sent to the DRC from Zimbabwe. The plan, officials say, is still being worked out. But the prospect has raised alarm over the welfare of the animals, the impact on the local ecosystem, and the possibility that animals from the DRC could be infected with Ebola. Zimbabwe has previously sold wild animals for display in China, leading some activists to fear the gorillas and okapis could ultimately end up in that country — an allegation Zimbabwean authorities strongly deny. Okapis (Okapia johnstoni), an endangered species also known as forest giraffes, will also be translocated from the DRC, Zimparks director-general Fulton Upenyu Mangwanya told local media during a visit to a nature reserve. The disclosure came on the heels of the controversial transfer of 10 white rhinos from Zimbabwe to the DRC. Zimbabwe’s government says the translocated animals will help boost the country’s tourism and bring diversity to the country’s wildlife. But news of the proposed transfer has raised concerns among both residents and primate experts. View from the summit of Mount Nyangani, Zimbabwe’s highest peak at 2,592 meters (8,504 feet). 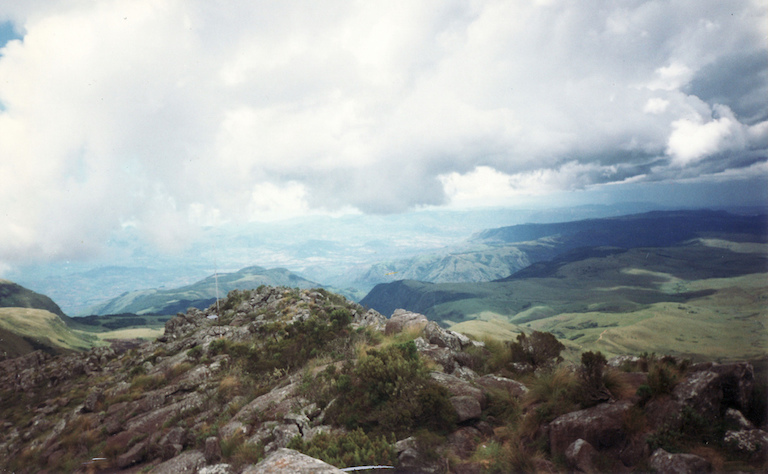 Located within the Nyanga National Park, the peak is sacred to the local population. Image by Damien Farrell via Flickr CC-BY 2.0. Nyanga, in the highlands of eastern Zimbabwe’s Manicaland province, has been floated as a possible habitat for the translocated animals. The area is famed for its cool temperatures and lush vegetation, nourished by several rivers and streams that course through the area. The mountainous terrain teems with wildlife, including zebras, waterbucks, impalas, blue duikers and elands. But the area isn’t suitable for either mountain gorillas (Gorilla beringei beringei) or okapis, says Mike Hitschmann, a wildlife expert with the Cecil Kop Nature Reserve in Manicaland. Both, he says, inhabit specific niches in tropical climates. “Where, specifically, would they want to keep them?” Hitschmann asks. “One would have to assume that they intend keeping them in a form of outdoor zoo scenario somewhere else in the country, assuming that the rumors are true,” he says. Hitschmann says he believes the facility he works with — a 15-square-kilometer (5.8-square-mile) wildlife park in Mutare, about 100 kilometers (60 miles) south of Nyanga — is the most viable option in Manicaland. “We have not heard from them on this subject,” he says. Liz Greengrass, head of conservation at animal welfare NGO Born Free, echoes concerns that the habitat in Zimbabwe is unsuitable for equatorial species like gorillas. Furthermore, she says, by entering into an animal exchange program, these countries are likely to be removing animals from the wild and keeping them in captivity. Any such transfer cannot be seen as a conservation initiative, she says. “The translocation has no benefits for the gorilla and is not only risky for the individuals, but also for the population at large, as it sets a dangerous precedent and undoubtedly goes against any international conservation commitments these countries have made,” she says. Many people in Nyanga also appear unenthusiastic about the possibility of introducing exotic wildlife into the area. James Matsito, coordinator for the Nyanga Community Development Trust, says he’s skeptical about the idea of bringing gorillas to Nyanga. Matsito also raises the concern that the gorillas might bring with them the deadly Ebola virus. The DRC is currently in the grip of an outbreak of Ebola, which can be transmitted between apes and humans. “How and who will test the gorillas, using which equipment, when our health sector is this dilapidated and run down?” he asks. Mangwanya, the Zimparks chief, has already attempted to allay the Ebola fears. “Don’t worry about the issue of Ebola because we will test them before they come here,” he was quoted as saying by local paper Newsday. But the assurance from Zimparks is not enough the quell Matsito’s apprehension. He says Zimbabwe’s health sector is currently failing to handle cholera and typhoid and doesn’t have the capacity to deal with a potential outbreak of Ebola on top of that. For Nicholas Kwadzanai Mukundidza, a Nyanga resident, the biggest concern is the impact the animals might have on the local ecosystem. He expresses alarm over the prospect of a band of gorillas being allowed to roam freely throughout the area, especially if their numbers grow over time. “I have learned that [the] gorilla diet is 90 percent vegetation, mainly wild fruits, roots, tree bark and pulp. And given that a male gorilla can eat up to 18 kilograms of vegetation per day, this will have a big impact on the forests,” he says, noting that most of the trees local to the area cannot survive if too much of their bark is removed. Mukundidza says the whole gorilla program lacks proper planning from the government and decision-makers. “These politicians are not thinking straight on this issue, they are planning this issue and want to force it on the people because they wield power,” he says. Zimparks spokesman Tinashe Farawo, however, says gorillas can play an important role in Zimbabwe’s tourism industry. He points to other African countries where tourists pay big money to see the primates. “Do you know it cost more than $300 to watch gorillas in Rwanda? That’s the kind of tourism we want in Zimbabwe. Gorillas contribute a lot to tourism revenue but we need to do more research before the gorillas come to Zimbabwe,” he says. Hitschmann says that if Zimparks is indeed entertaining the idea of bringing gorillas or okapis to Manicaland, the agency needs to think about more than just potential tourism dollars. “Are they bringing them here purely to ‘display’ them to the public or are they considering setting up a breeding program since both species are endangered?” he says. 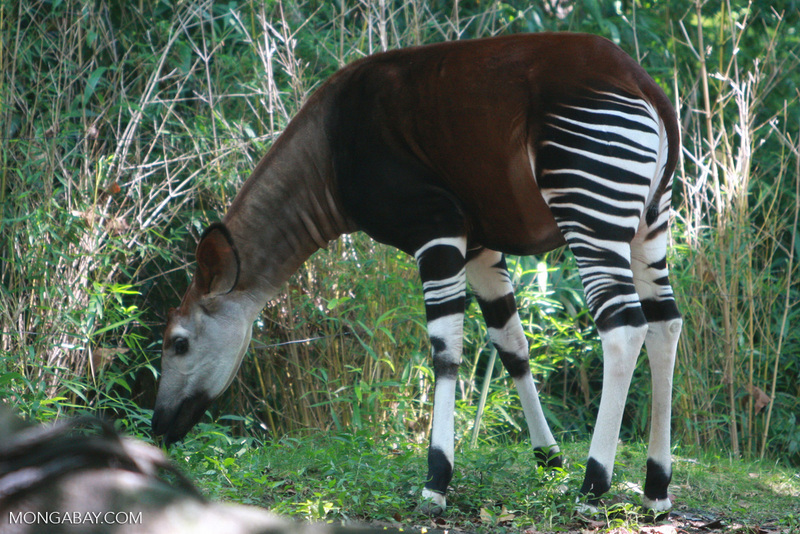 Native to the DRC, the Okapi (Okapia johnstoni) bears distinctive zebra-like stripes but is actually most closely related to giraffes. The species is classified as endangered by the IUCN. Image by Rhett A. Butler/Mongabay. Some observers have raised questions about whether the animals will even end up in Zimbabwe. Zimparks has a history of sending wildlife, notably elephants, to China for display in zoos and parks. “It appears that, for some reason best known to themselves, various occupants of decision-making posts in the [Zimbabwe] Ministry of Environment have consistently been making bad decisions with regards to the management of our wildlife,” Hitschmann says. In June this year, there was an outcry among wildlife groups after leaked correspondence between the DRC’s environment ministry and a Chinese company hinted at a plan to provide Chinese zoos with endangered species, including okapis and mountain gorillas. Following the furor, the DRC government issued a statement saying no deal had been reached between the government and Chinese zoos, and that the proposal was still being evaluated under the Convention on International Trade in Endangered Species of Wild Flora and Fauna (CITES). Some activists worry that these exports might go forward under the guise of the Zimbabwe-DRC wildlife exchange program. “No such donation will be received” by Zimbabwe, U.K.-based animal welfare activist Sharon Hoole says of the plan to send gorillas and okapis from the DRC. She says she fears that they, along with Zimbabwe’s rhinos, may ultimately be sold for display in China. 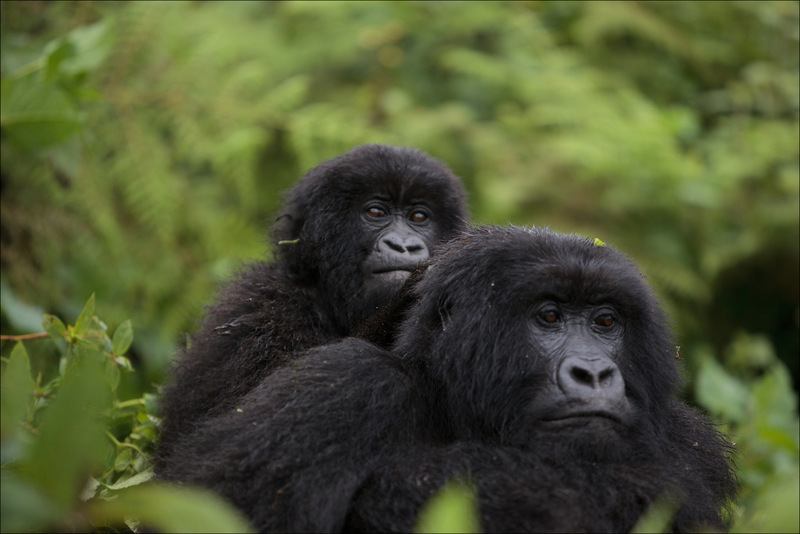 Adult mountain gorillas can eat 18 to 20 kilograms of food every day, the bulk of that leaves, stems, bark and buds. Nyanga residents fear their local flora could not survive the depredations of a large group of gorillas. Image by John C. Cannon/Mongabay. Zimparks spokesman Farawo denies that Zimbabwe is clandestinely exporting endangered wild animals to China under cover of the DRC-Zimbabwe wildlife exchange program. He defends the work carried out by his agency. “Before we even sent the rhinos to DRC we had to make sure that there was game water in that country. We had to make sure there was proper habitat and security. We looked at all these conditions and they were all met. Many people never appreciate what we’re doing as an authority,” he says. Similar preparations are now being made for the receipt of the animals from the DRC, Farawo says. “We don’t have the dates yet, we’re still carrying out researches,” he says. But even with the best of preparations, the process of capturing and removing gorillas will inflict a huge amount of unnecessary stress, potentially harming both the individual gorillas and their family members, says Born Free’s Greengrass. “Born Free wholeheartedly opposes this practice, particularly considering how threatened gorillas are and the poor standard of care given to animals in African zoos. If both countries involved were to go ahead [with] the translocation, they would likely receive negative international attention,” she says.